Each of us can write a book. Each of us has experienced something special and unique at least once, especially when we talk about college life. So, all we need to do to write a story is to cut out a small but very impactful piece of our life and tell about it. That is how you can choose narrative essay topics. In the article I offer a list of the best narrative essay topics for college students to rescue everybody from the writer’s block. But I’d like to start with one of my personal narrative essay topics – the story about what helped me become a reliable narrative writer. And I believe these tips will help you compose an outstanding narrative essay too. How to Come up with the Idea of the Topic? How to write a narrative essay? Which topics for a narrative essay to choose? Good writing begins with a great idea – the idea that your professor or more important readers just can’t ignore. Here are some tips on where to look for such topics for a narrative essay? Try to analyze everyday experience and turn it into something miraculous. Your existence can provide you with creative and smart topics. Wonder out loud about everything. Once I bought a cup of tea at Starbucks. (Yes, I drink green tea at the coffee shop where all people order cappuccino, ristretto, etc.). So, I looked at the paper cup and wondered who had come up with the idea of a mermaid with two tails? Then we went to stadium to watch the incredible match of Champions League between Roma and Barcelona. At some moment I wondered who actually designed the epic eight starts encompassed in one circle? This is one of the iconic logos that the greatest football players have on the sleeves of their T-shirts. Why are there only eight starts? Why has such simple idea become the most recognizable one? After I combined the topics of Starbucks and the eight-star logo in my mind, I wrote a nice article about the most famous advertising images that have changed our world. There were Nike’s swoosh, the half-eaten apple, the windows of Microsoft, to name but a few. It all started while I was drinking Starbuck’s tea and just wondering. One good joke asks us, if we are not allowed to eat at midnight why is there light in the fridge? I bet this joke occurred to its awesome author’s mind when he or she just opened the fridge and got something to eat. We are surrounded by great personal narrative essay topics. We just need to notice them. Another way to write an unusual essay on an interesting topic is to look at things from a different viewpoint. For example, did everyone in your class write Arthur Conan Doyle’s biography? Then you can compose a narrative essay about the hidden details in “The Adventure of the Speckled Band” and their meanings or about the differences between the movie and the stories. I will even give you a hint: Sherlock never really said “Elementary, my dear Watson.” Surprise the readers with the topic, make them reconsider what they know. By that I do not mean the inspiring story of John Davison Rockefeller, who made a million out of one dollar. I mean a real story that concerns you, your friends and college mates. When I was studying the history of art at university, our professor told us about a Soviet artist Constantine Rudakov, who designed costumes for theatrical performances in Saint Petersburg during World War II. It is not supposed to be exactly the narrative about your family. It should be a real story of a person – of someone who went to your college and won a championship or played football with little Pele. Write about something that may seem insignificant but concerns you or your friends deeply. Remember that good narrative essay topics surround us. Just be sure you look for them. A narrative essay is just a story based on your personal experience, either a good or a bad one. You are welcome to tell about something that happened only to you. The main thing is to describe your emotions and feelings. So, now let me provide you with some topics for a narrative essay and ideas of how to introduce them. This topic is deeper than the ocean. Usually, when we do not know how to act, we act like idiots. Our first efforts to do something in something are gold mines of hilarious or sometimes heartbreaking stories. So, you can compose a narrative essay about a funny or unusual situation you found yourself in for the first time. My first day at college/school/work. My first week of living alone. This topic runs the world. My first kiss. (“My first date”, “My first night away from home”, “My first night of staying home alone”). It is believed that chronologically the first memories that our brain stores come from the times we are 3-4 years old. Try to imagine what such memory of yours can be about. Describe the picture. Think why it is stored in your mind. This is one of my favorite topics for a narrative essay, actually. You can write a touching narrative essay about how you met your first crush. Try to recollect him or her. I bet you have something to tell about. My first experience of parachuting/riding a roller coaster/playing guitar/flying by the plane/meeting Justin Timberlake. In your narrative essay tell what happened next. It can be a victory in some international tournament, in Dota 2, football, or a quiz. The first time I watched a basketball, tennis, hockey game. Personally, I can talk about this topic all day long. That is why I am sure you have a whole bag of memories and thus good narrative essay topics to write about. Was it a city of your dream or a village you would like to forget? If you had money to burn, what would your first destination be? You can write a narrative essay not only about a country of your dream but about a very specific place or even about the space. An unexpectedly crazy adventure of my life. What is the most amazing view you have ever seen while traveling? Did it cost a lot of money to get here? Write a narrative essay about your journey to unknown places. Or write about well-known places you have been to but mention some unusual things you have seen there. It is up to you how you introduce the topic. If someone proposed you to choose the country to live in the rest of your life, what country would it be? Your homeland or, maybe, a quiet town on the Portuguese coast, for example? The most useless souvenirs I brought from trips. The city I would never come back from. It can become a great topic for your narrative essay. Things you should do/know while traveling. Basing on your personal experience, write a narrative essay on the ways to save money while traveling, tips on where to go if you are traveling alone, etc. Do you think it is better to travel on your own or with friends? The word “personal” is actually the key for writing a great narrative essay. Using the block of topics provided below, you can describe your experience in achieving goals despite hardships. An achievement I am proud of. How have I stepped out of my comfort zone? A challenge that made me stronger. My secrets of getting fit. My long/hard/easy week without Instagram. You can write a narrative essay about your experiment and its results. From a weirdo to a prom queen/quarterback. Write about the changes in you. Personal changes always make a great topic. It’s a very broad topic, actually. It could be a narrative essay about the way you managed to change your attitude to someone or something. Think what made you change your mind? My secrets of being everywhere on time. My strategy to memorize/read/write more. How to stop meeting someone’s expectations and start reaching your personal goals? This topic melts my heart. Believe me, it will touch your teacher or college friends too. They will definitely understand what you are writing about. What my mom and dad taught me. Maybe, once your dad forbade you to take his car. You did it anyway, broke the car, and since then you always listen to parents’ advice. I have a lot of stories to introduce this topic in my essay. And you? What do I know about the history of my family? Would you tell me the name of your grand-grandfather if I asked? Will you treat your children like you parents treat you? My worst family fight and how I get over it. Why were we laughing so hard and so long? It can be the funniest story that has ever happened to you or your dearest and nearest. Do your parents understands you? Do you have special methods of getting along with your parents? Maybe, there is a family story explaining why your parents named you Lili/Mike/Kate. Narrative essay about my parents’ love. Have you ever told your friend that “some thing” was the most incredible thing in your life? When you should write a narrative essay and can’t come up with a good topic, remember about something the MOST unbelievable, unforgettable, or challenging. Write it to laugh at your embarrassment, to show that everything happens for reason, and to realize that time does cure. The most dangerous situation I have ever faced. The most important moment I will keep in your mind forever. The most precious childhood moment. The most difficult challenge I have raised to. The most memorable quote I have heard. When did you hear it? Why do you still remember it? I adore this topic. The most meaningful book/movie/work of art that impressed me. The most impressive game/show I have ever watched. The most delicious meal I have ever eaten. Did your mom cook it? Or you tried it at the restaurant? Was it worth your money? Wow! It looks like now you have 50 narrative essay topics to choose from! But how to do it? Imagine you are invited to TED Talks. What would you personally speak about? How to Write a Narrative Essay Everyone Will Be Curious to Read? The recipe is simple: when you know the topic for narrative essay, make sure it is interesting to read. 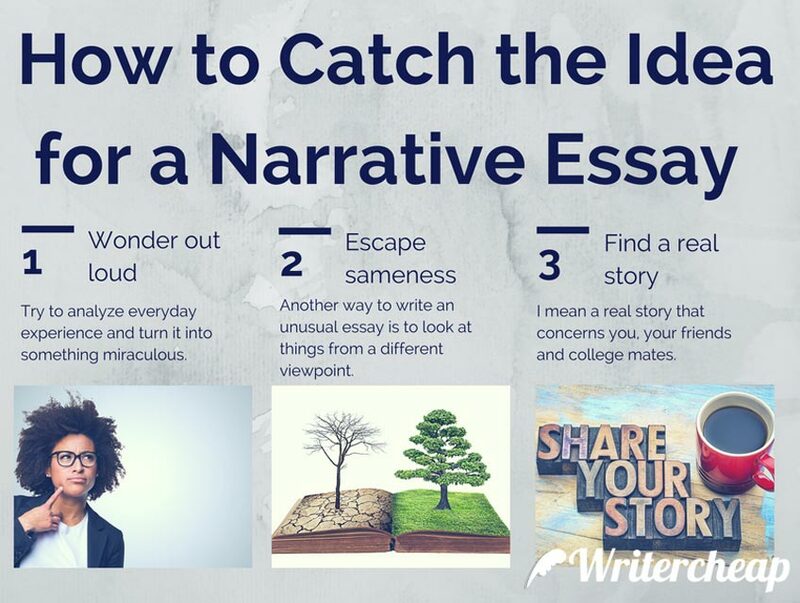 Come up with one idea that will make your narrative essay different. Use your schtick: sometimes it can be just a catchy topic. Use a specific style of writing: your story can begin from the ending and guide the reader to the beginning, for example. Or add a joke. Make readers care. It is the most important thing in writing narrative essays on any topic. You can tell a heartbreaking story or mention something that is so familiar to all people. Make some references to popular TV series, shows, or songs. Describe a situation that your friends from college can understand. Your story should guide the reader. It is like an unwritten agreement between you and them. Your essay should be worth the time your reader spends on it.